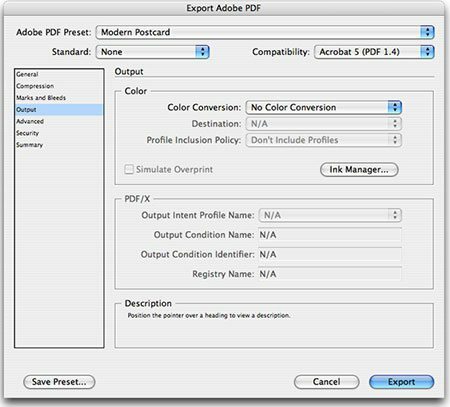 Please download and use our Adobe PDF Export Settings. 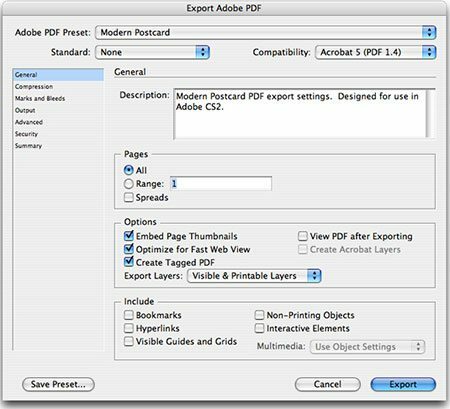 Or follow the next steps to export your PDF. 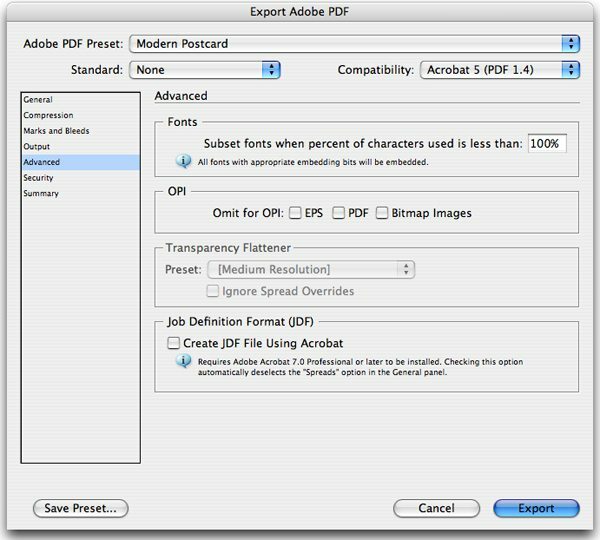 Set Compatibility to Acrobat 5 (PDF 1.4), set the Page Range to the page you are exporting, and be sure the following are checked: “Embed Page Thumbnails,” “Optimize for Fast Web View,” and “Create Tagged PDF.” Be sure all other options are off. Set all images to “Not Downsample”, set image compression to “None”, do not compress text and line art, and be sure “crop image data to frames” is selected. 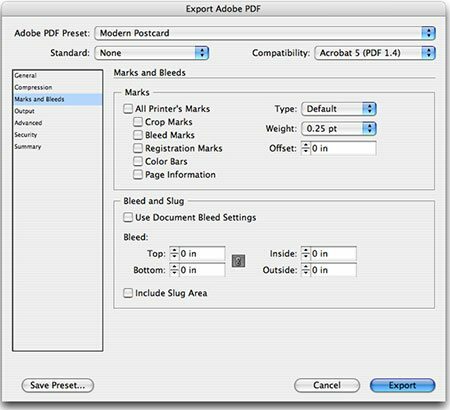 Do not select any marks, these are not needed as the pdf will be created at correct print size. Be sure that NO bleed is selected (bleed is already accounted for by using our templates). Some options are grayed-out. Please subset fonts and DO NOT use OPI or JDF Options. Please DO NOT apply security to your PDF file. We will be unable to open it unless you supply us with the password. 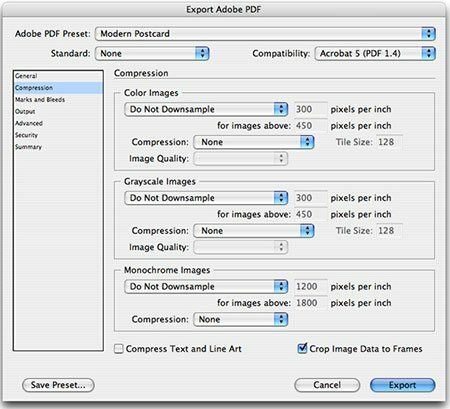 Click “Export” and a PDF will be exported. After generating PDF files, you may send them to us on disk (Zip or CD) or upload them over the internet. Be sure to compress your files prior to sending them over the internet. 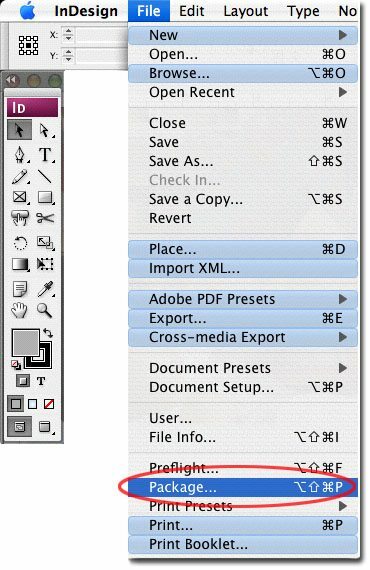 InDesign CS3 users may export a PDF or provide all support files (layout, images, and fonts). The “Printing Instructions” dialogue box provides information for a text document that is created with the gathered files. We do not need this additional information. 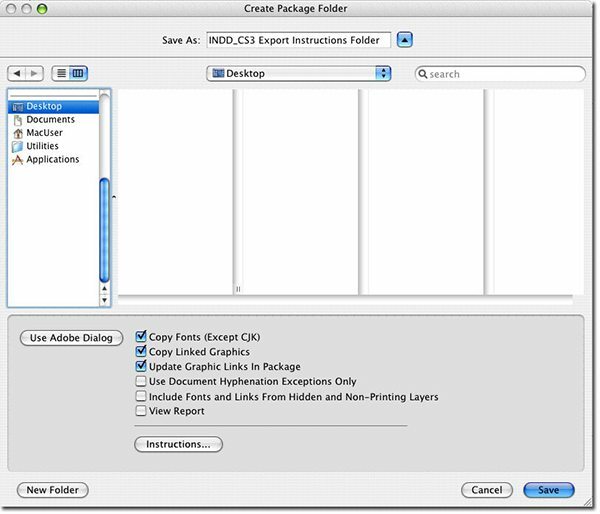 Continue to the “Create Package Folder” dialogue box. Select a location on your hard drive where the folder will be created (Desktop). Make sure the buttons are selected to “Copy Fonts” and “Copy Linked Graphics.” Any images embedded to your layout will not be collected and do not need to be submitted separately. A folder will now be located in the place you chose. The folder should have the InDesign layout, a folder for Fonts and Links. You may send these files to us on disk (Zip or CD) or upload them over the internet. Be sure to compress your files prior to sending them over the internet.